This handbook is an output of the first International Workshop on Public Private Dialogue, held in Paris in February 2006. It has been informed by papers and case studies written for presentation at that workshop, and a number of other seminal documents. 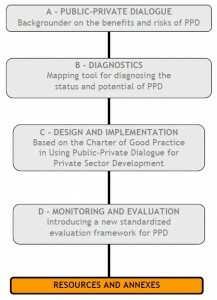 70 articles and resources on the topic of public-private dialogue have already been referenced in “Competitiveness Partnerships: Building and Maintaining Public-Private Dialogue to Improve the Investment Climate”, Herzberg and Wright; The World Bank, Policy Research Working Paper Series, no. 3683, which is available online . This Handbook draws in part from those references. Instead of listing them again, the authors have chosen to list only references readily available online, and indexed by topic and countries on www.publicprivatedialogue.org. The website is constantly updated with links to the latest relevant materials about PPD, and aims to be a comprehensive collection of documents and links which will be of interest to PPD practitioners. All documents referenced in this bibliography can be accessed through the website. Readers are advised to check these website links for new information which may also be of interest. organization of links to these source materials on the website. Short descriptions of key papers are provided so that this bibliography can also serve as a recommended reading guide. Many of these papers also have associated PowerPoint presentations by the authors, also available on the website. Benjamin Herzberg & Andrew Wright; The World Bank, Policy Research Working Paper Series, no. 3683. A resource drawn from the review of experiences of 40 countries. The paper is designed to be used as a resource by donors, governments, or businesspeople who are interested in establishing, maintaining, or improving a competitiveness partnership in their country or region. It distills some ideas and techniques from best practice, offering a selection of valuable insights into how practitioners can avoid common pitfalls. The paper has three parts. Part One outlines what competitiveness partnerships can achieve. Part Two presents issues to consider when designing such partnerships, and Part Three identifies challenges that are frequently faced and strategies that have been used to overcome them. ranging from highly formal and structured to informal and ad hoc. It identifies success factors and lessons learned, and includes a helpful list of dos and don’ts for donors. Based on an investigation into the conditions of public-private dialogue in sub-Saharan Africa, this paper aims to pinpoint institutional prerequisites – effectiveness of the bureaucracy, organization and maturity of the local private sector, political environment – for productive dialogue. A helpful distillation of some best practice in public-private dialogue drawn from experiences in several countries, with emphasis on SME promotion in the developing world. Especially valuable on identifying the conditions and culture which are conducive to dialogue and on discussing the role of private sector representative organizations. A philosophical and practical overview of the value and limitations of participation in formulating public policy. Discusses the costs and benefits of efforts to increase participation, identifies circumstances which are most propitious, and assesses some practical problems of expanding participation and strategies to deal with them. experiences in Mexico and Mongolia and also draws on other country experiences to distil lessons for promoting competitiveness through clusters. A valuable report on how policy makers in European countries consult with small businesses. It finds that since small enterprises constitute approximately 99% of businesses in all European economies, it is essential that the policy makers carefully listen to their opinions, involve them in the decision making process at an early stage and take their specific situation and their interests into account when developing new legislation and policies. Along with providing several interesting case studies, the report includes twelve recommendations addressed to national and regional governments on how to establish a more efficient dialogue with stakeholders and improve the consultation procedures. A brief “how to” note extracting the practical lessons emerging from the larger Bannock Consulting review of DFID’s PPD experience (see above). Alejandro Alvarez de la Campa et al. 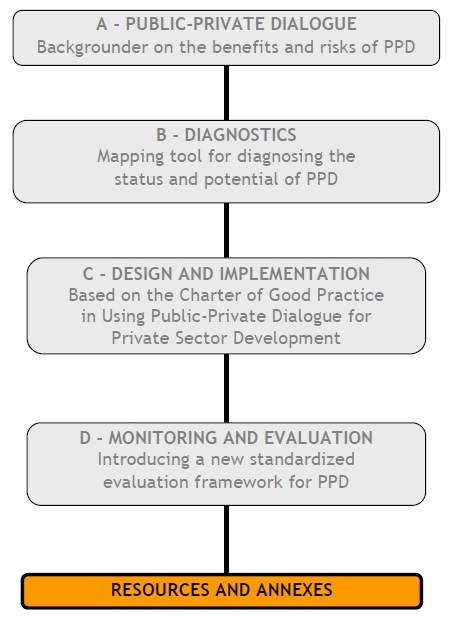 A valuable resource which looks at participatory and process-oriented approaches for monitoring and evaluation in public-private partnerships. It reviews lessons learned and looks at a case study from Macedonia. This is a draft paper prepared for the international conference on “reforming the business environment”, held in Cairo in November/December 2005. This article discusses the principles of social marketing with reference to the efforts of the Bulldozer Initiative in Bosnia to change attitudes among entrepreneurs, legislators and the general public. A set of questions and annotations for governments to consider in ten policy fields identified in the Monterrey Consensus of Financing for Development as critically important for the quality of a country’s environment for investment. material and examples of good practice on each of the ten chapters of the PFI. Looks at specific experiences of dialogue in Uganda, Ghana, South Africa and Zimbabwe to explore the relationships between dialogue, economic growth and democratization. Especially interesting on the connections and potential tension between growth and democratization and the role of donors in addressing that tension. Describes a project to use tripartite dialogue – government, trades unions, business – in five EU candidate countries to help them prepare for meeting the Maastricht criteria for joining the Euro. Split into five individual country reports which contain useful discussions of the state of publicprivate dialogue in each country. Central and Eastern Europe. Looks at some of the challenges faced by transition economies, especially in industrial relations and enterprise development, and usefully explores the scope of social dialogue to manage change. Takes stock of social dialogue in the ten Central and Eastern European EU candidate countries plus Turkey, Cyprus and Malta. Especially good at outlining the legal, institutional and political basis of employer and trade union organizations, and assessing how effective interaction between them is in preparing for EU membership. subject of public-private dialogue. Contains a good exploration of general lessons about dialogue – its aims and scope and best practice in implementation – together with discussions of experiences both in the Pacific region and beyond. construction of the Mercosur trading area. established, its benefits and constraints, and how dialogue can be strengthened and enhanced in the future. techniques were used to build bottom-up support for economic reform, change social attitudes and enthuse small and medium entrepreneurs. Based in part on illuminating interviews with participants, provides a helpful general synopsis of public-private dialogue in Botswana, describes how the current structures for dialogue evolved and how they function, and contains a useful discussion of their respective strengths and weaknesses and lessons that can be learned. environment since the mid-1990s. Explores both formal and informal consultative mechanisms. Especially useful for the negative lessons that can be learned from instances of dialogue that have not been found effective. Is it possible to institutionalize a public-private dialogue mechanism to reform economic regulation and policy in Mexico by the end of the current administration?